Many students across the world dream of studying in the leading b-schools of the world and there are many solid reasons for it. 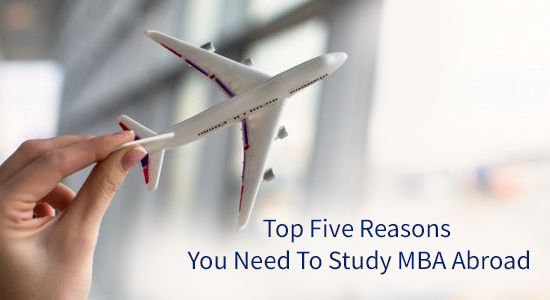 Let’s take a more in-depth look at the top five reasons why many students like you want to study MBA abroad. You enter into the world of excellence when you study at the world’s premier b-schools. From the faculty to peers to alumni to recruiting companies, you are in the ?? company of sheer brilliance and excellence. You will be interacting with and learning from the greatest minds in the world. Their ingenuity is sure to rub on you. When you study abroad, you enjoy greater networking opportunity with a wide range of achievers – fellow students from diverse backgrounds, professors and teaching staff, alumni, and potential employers. Several B-schools abroad enjoy elite celebrity status. For example, top-ranked tennis star Maria Sharapova studied product marketing at Harvard Business School in 2016 during her suspension from tennis. The top b-schools offer the highest level of education. There is a strict process when it comes to the learning delivery execution, and you need to meet all deadlines with precision. The curriculum is continuously updated and aligned with the current and futuristic business trends. You will be learning and relearning several concepts. You will find it easy to understand complex subjects with the complete training and support from the faculty and your peers. You have the freedom to express your ideas openly without any fear of being judged. The average salary earned by an MBA graduate from a premier B-school abroad is much higher than that of an MBA graduate from an Indian B-school. An MBA from the world’s premier B-School fetches you a top salary plus incentives. You are offered the best jobs from the world’s topmost companies that are eager to hire graduates of these schools. You can command greater authority to negotiate your pay package. Your annual salary will always be above the industry standards. With an MBA degree from a premier b-school abroad, you hold the ticket to the fastest route to career advancement. You are offered senior managerial and C-suite level positions, superseding senior Non-MBA people working in the company based on your premier MBA degree alone. You are also eligible for the best company perks and benefits. You don’t achieve only professional success when you study abroad. Studying in a foreign country teaches you so much about culture, ethics, etiquette, and helps you develop a holistic perspective. You are vulnerable in a foreign country and how you absorb all the learnings will sharpen your business acumen. These experiences will help you gain keen business insight and constantly adapt and thrive in the rapidly changing business world. Studying and working abroad broadens your horizons and gives you the wings to realize all your professional and personal ambitions. The first step begins with enrolling with the best GMAT coaching Hyderabad and cracking the GMAT exam. There is nothing which is impossible to achieve. If you need more assistance with career planning, you can Contact Manhattan Review India, for guidance on GMAT training Hyderabad.